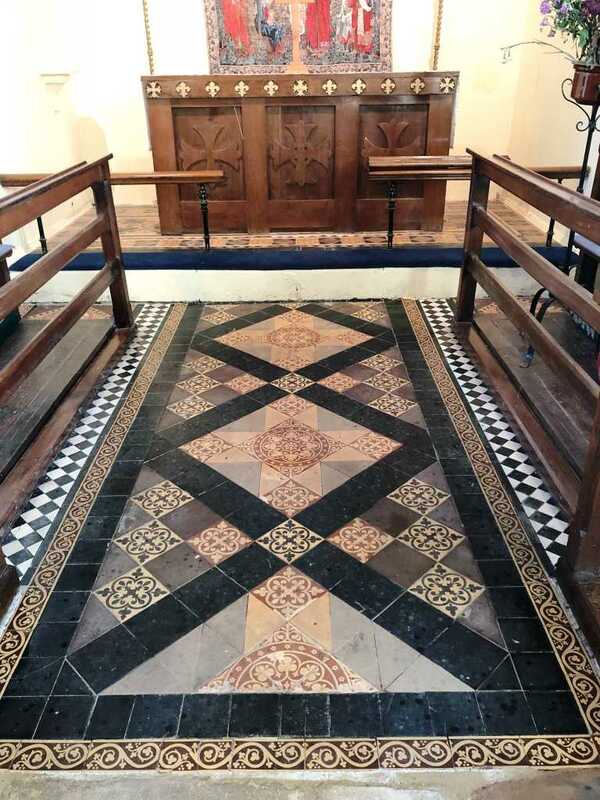 I recently completed a Victorian floor restoration at St Michaels Church in Rushock which is a very small village in Worcestershire in the Wyre Forest District. The church is a listed building that dates to 1758 however I suspect the floor was installed in 1872 when the building was subject to a major restoration. Interestingly its most famous as the resting place of Jon Bonham from Led Zeppelin who is regarded as one of most influential rock drummers in history. 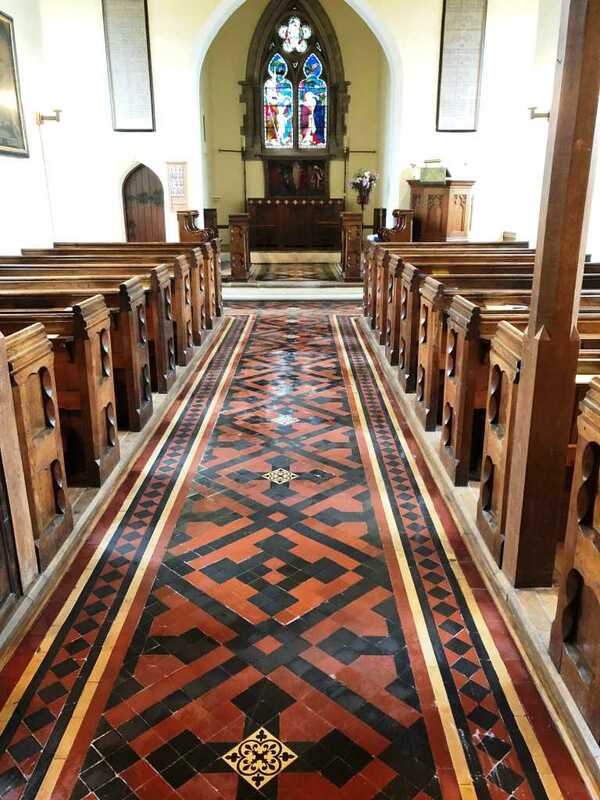 I was contacted by the church as the floor had become dull and the floor was experiencing efflorescent salt issues. The chairman of Rushock church was unhappy with its appearance and was keen to have it restored to ensure the church looked it’s best for the residents and the churches parishioner’s. 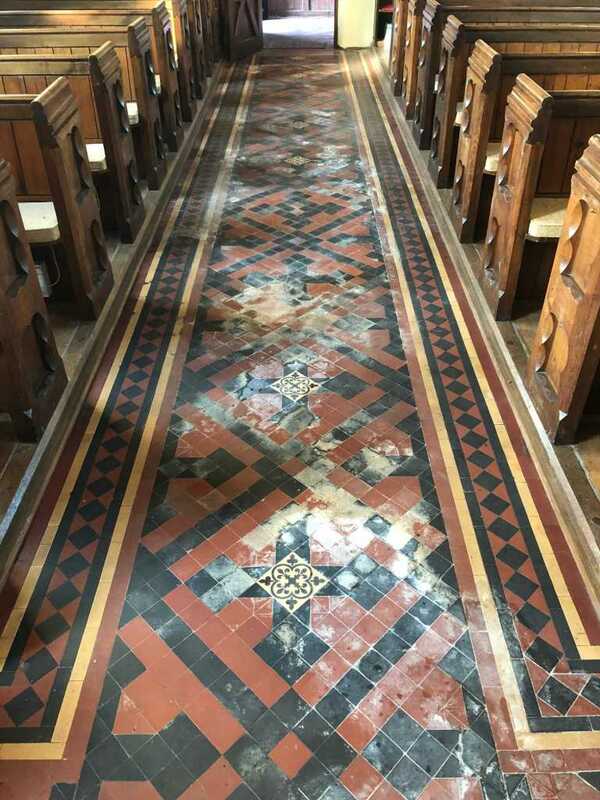 I completed the inspection of this beautiful church and as you can see from the pictures why the chairman was so keen to have the floor renovated. Confident we could significantly improve the floors appearance and restore the feature aisle for them I costed out a plan for the work. The quote was accepted, and we arranged a mutually convenient date to fit round their service schedule. An extra pair of hands would be required to meet their schedule, so I arranged to work on this floor with the Warwickshire Tile Doctor Mick Gayton. Mick has a wealth of knowledge and experience and we often team up on bigger projects. With over sixty Tile Doctors in the UK it’s hugely helpful to have a network of Tile Doctors you can call upon when you need extra help. The first day was spent cleaning the floor both by hand and with a rotary machine fitted with a black scrubbing pad paying particular attention to the salt issues. Tile Doctor Remove and Go was applied first to tackle the dirt and remove what remained of the previous sealer. This was then rinsed off the floor and the soil extracted using a wet vacuum. We then treated the floor to an acid wash using Tile Doctor Acid Gel, this was applied to the floor and left to dwell for a short time before more scrubbing in with the rotary machine. This made short work of cleaning the salt minerals and grout haze, it would also neutralise any alkaline salts inherent in the tile that could cause problems later. The wet vacuum was employed again to remove the resultant slurry. We also used a steam cleaner on some of the stubborn areas where the dirt had been ingrained for some time! Once we were happy the floor was clean, we left the floor to dry off overnight. We returned the next day and got to work on some areas where the grout had perished, replacing as needed with a matching flexible grout. Once the grout had dries and any haze polished off the tiles the floor was ready for the application of a protective sealer. The sealer chosen was Tile Doctor Colour Grow which is an impregnating colour enhancing product that works by occupying the pores in the tile preventing dirt from becoming lodges in there. This sealer is also fully breathable which is an essential feature for old floors that were laid without a damp proof membrane. Using a non-breathable sealer would trap moisture under the floor where it can spread to the walls resulting in rising damp. Four coats of Colour Grow were required in total and the colour enhancing nature of the product really brought out the colours in the tile restoring it to its original condition. 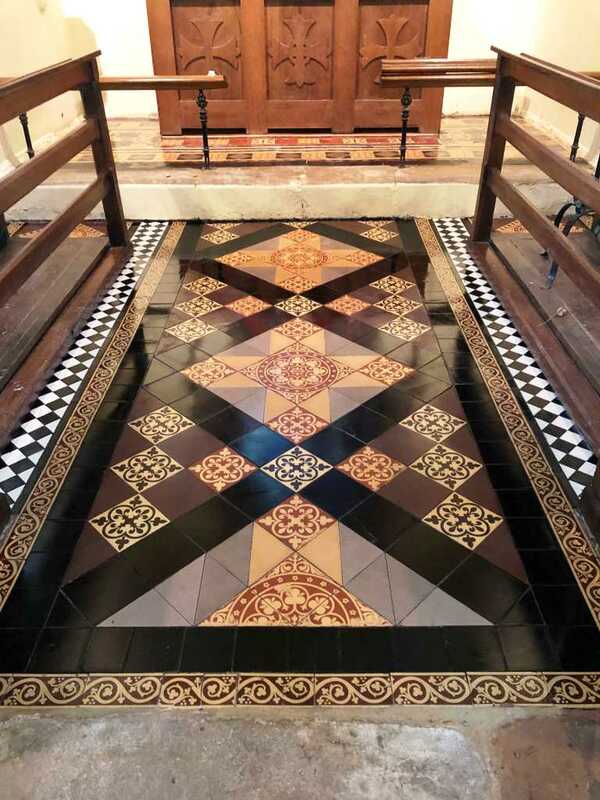 The chairman was extremely satisfied with the restored floor and he was sure the parishioners would be to.